Do you value the NHS? From cradle to grave the NHS is one of the greatest achievements this country has, one that continues to function under the continuous pressures. Though forever changing and adapting in a method that some may deem darwinism it prevails over all that continues to be thrown at it. Can you see yourself getting old? Think about it… Over the time it takes you to get there think about how many times that you would have been in and out of your local or any other hospital, to your GP, seen a health visitor or any other medical professional along the line. If all of the hard working individuals that work for the NHS making it what it is today and continuing to keep it ticking over put all of their hours together there would be a significant amount of time of the clock. Enough time to save a life some may say, enough time to make a significant difference at least. Think of it in air miles – around the world isn’t far enough even twice. From 1948 until the present and far into the future (I hope) the NHS is the one pillars of the community that despite vigorous scrutiny remains a constant and pushes through all of the tough times, fighting battle for us all and coming out on the other side wounded, battered and severely bruised but still fighting for another day. The stories that have been told from day one right up until today and the stories that are yet to be told are those that will be listened to in awe – whether bad or good the NHS is always there. It may have days where it is thin on the ground and seems a little old and frail, as we all will at some point. However, please remember that with time it continually evolves and like a phoenix rising from the flames is reborn again ready to take on yet another challenge. As a nurse, a patient and relative that has at many times in my life in some way been intertwined with this great being I am personally grateful for the NHS. With both of my parents being NHS retirees the NHS is always something that will be special to me. 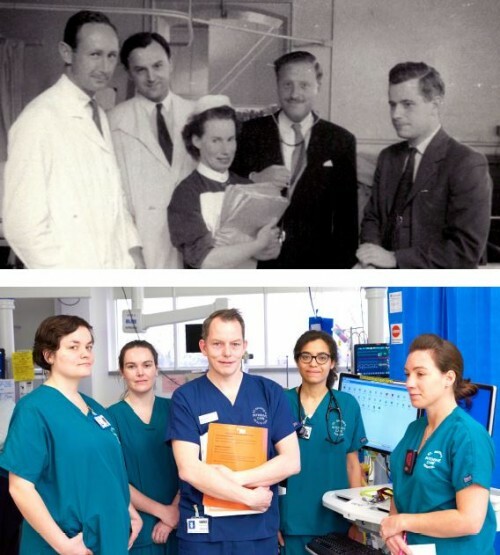 This photo was taken at the hospital I am proud to work for showing the changes that have happened over the years. Plus right in the middle there (bottom pic) is my Head of Nursing – I’m very proud. Why do I love the NHS? Well, that’s for me to know. BUT, I hope that you will join me in saying Thank You and HUGE HAPPY 70TH BIRTHDAY. This day is especially personal to our family as every year on the 5th July we celebrate my dad’s birthday and my parents anniversary even though he is no longer with us. So as you can imagine this is a triple whammy for me. Happy Birthday to my beloved NHS and I wish you many more.